Will Wearables Find A New Purpose In The Fitness Club? So, things in the realm of wearable technology are moving pretty quickly. Last year I was singing the praises of wearable devices. Then, earlier this year I thought they were going flat. Now, I’m changing my views again because of recent announcements. Everything changed in the time since I decided to write this post and when I actually sat down to compose it it’s like a whole new topic. While the wearables category includes everything from connected clothing to sticky medical sensors, it’s the new smartwatches that seem to be getting traction so suddenly. Fitbit has come out with the Ion watch, and Apple is now launching its third generation of smartwatches. It looks to me like watches are the devices to watch out for in the gym. 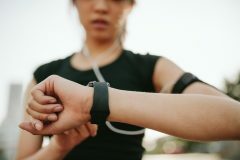 I noted recently in my post about the Trends For Gym Owners that the growth of wearable technology was looking flat and a recent report on Worldwide Wearable Devices seemed to confirm that. Now, smart watches and wristbands look like growth areas again. In spite of all the news and product launches, the question is, are wearable devices a solution in search of a problem? And yet there are so many possible problems that they could address. The trend cooled somewhat, but the new Apple Watch has made me wonder again. Wearable devices are anything that you attach to your person, which connect to the Internet and give you value in the form of information to move your life ahead somehow. Medical technology and healthcare are finding uses, but they are very niche. In practice, wearable devices use connections like NFC, Bluetooth Wi-Fi or cellular. Typical information that they pass on includes biometrics and geographic locations. Wearables are excellent at supporting the fitness and healthcare industries because they capture your state and movement. Apple has just rolled out the Apple Watch 3, and the manufacturers are still intent on tinkering in the space, and Samsung has released the Patch health-monitoring device. I think that there’s some kind of killer application hiding around the corner, but what is it? The key features of wearables are that they combine sensors and data links. Whether or not they receive data too, the important part is that they capture readings and forward them to another device. The promise that they hold to gym owners is the potential to communicate with members through IoT connected equipment and on-site digital links. As an aside, perhaps the most revolutionary new functionality would come if a wristband or smart Band-Aid were able to measure blood sugar through the skin. The rates of diabetes are insane in the United States, and anything that can help victims regulate blood sugar painlessly, through the skin must be a good thing. The Verge reports that Apple is rumored to be working on such a sensor for the Apple Watch. However, at the rollout of the Apple Watch 3 is doing a brisk business and expanding the capabilities of the hardware and operating system. The new watch extends its fitness-related capabilities, which makes sense given the potential size of the market. Apple’s operating system and the new watch will share data with equipment from brands such as TechnoGym, Life Fitness, Star Trac, and StairMaster. So, once the system rolls out and third-party developers get familiar with it you can expect some as yet unimaginable data applications to benefit fitness center operators and their memberships. The Apple Watch 3 and Fitbit Ion make me think that the wearables market has picked up some momentum once again. The signs indicate that it’s going to bring other makers back into the market as well. The first company that does discover a winning use-case that combines smartwatches and other wearables into the lives of consumers the way smartphones has it made. The brand that does that is sure to dominate consumer tech in decades to come. Borde, Rishabh. Worldwide Wearable Devices Shipment 2017 – 2021: Fitness Bands Are Dipping In Popularity. June 27, 2017. https://dazeinfo.com/2017/06/27/worldwide-wearable-devices-shipments-2017-2021/ (accessed October 1, 2017). Burh, Sarah. The 22 Best Apple Watch Health And Fitness Apps. April 24, 2015. https://techcrunch.com/2015/04/24/the-22-best-apple-watch-health-and-fitness-apps/ (accessed October 1, 2017). Fagan, Lawrence. Trend Watching For Gym Owners In 2017. January 1, 2017. https://blog.gyminsight.com/4164-trend-watching-for-gym-owners-in-2017/ (accessed October 1, 2017). IDC Media Center. Wearables Aren’t Dead, They’re Just Shifting Focus as the Market Grows 16.9% in the Fourth Quarter, According to IDC. March 2, 2017. https://www.idc.com/getdoc.jsp?containerId=prUS42342317 (accessed October 1, 2017). Langley, Hugh. Week in wearable: Fitbit Ionic verdict is in, as the next smartwatch battle heats up. September 23, 2017. https://www.wareable.com/wearable-tech/week-in-wearable-tech-fitbit-ionic-verdict-is-in-smartwatch-battle-4492 (accessed October 1, 2017). McCormick, Rich. Apple is reportedly working on sensors for diabetes treatment. April 12, 2017. https://www.theverge.com/2017/4/12/15282270/apple-diabetes-sensors-blood-sugar (accessed October 1, 2017). Protalinski, Emil. Fitbit Ionic review: A basic smartwatch with amazing battery life. October 1, 2017. https://venturebeat.com/2017/10/01/fitbit-ionic-review-a-basic-smartwatch-with-amazing-battery-life/ (accessed October 1, 2017). Samra, Husain. And finally: Apple Watch Series 3 is selling faster than expected. September 24, 2017. https://www.wareable.com/apple/apple-watch-series-3-selling-fast-399 (accessed October 1, 2017). Sawh, Michael. Samsung S-Patch 3 could deliver serious health monitoring. June 7, 2017. https://www.wareable.com/samsung/samsung-s-patch-3-release-date-price-specs-4609 (accessed October 1, 2017).